2002 B.F.A. Faculty of Fine Arts Baroda. 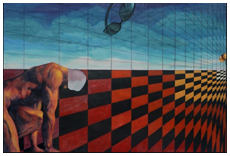 2004 M.F.A Faculty of Fine Arts Baroda. 2004 Peer -04 Recedency at KHOJ, Delhi. 2005 Workshop for site specific works at Samod. 2005 Artist workshop at Pachmari. 2001 Ila Desai Scolarship M.S.U. Baroda. 2005 Thresholds and Distances. Group Show at Guild Gallery, Mumbai. 2005 IN-CINQUE.Group show at palette Art Gallery, Delhi. 2004 Open Studio Day installation: Matrixmwe love America. America loves us. 2004 13 Artist Show Sarjan Art Gallery Baroda. 2004 PICASSO & POLLOCK. Installation Faculty of Fine Arts Baroda. 2004 Group show at Ravindra Bhavan Lalith Kala, Delhi.